after a run of five home defeats. "He was a fantastic manager and a fantastic person, and we all have only good memories of him. 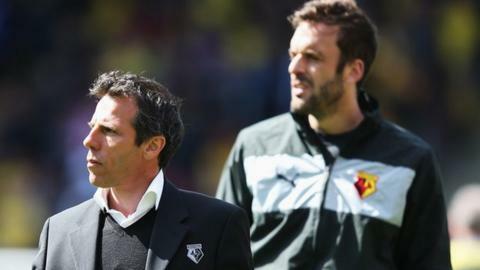 "Gianfranco will be kept in our hearts, not only the players but the whole club," 36-year-old captain Almunia told BBC Three Counties Radio. "It's been very hard days for us because Gianfranco gave us so much, to every single player, and the club. "I just want to say thank you for everything he gave us, for the support, his character, his kindness." Almunia was just three weeks after the Italian took charge in July 2012. The Spanish keeper said the players should shoulder the blame for the run of results that led to Zola's departure, and it was up to them to put it right, starting at Ipswich on Saturday. "The new manager cannot do anything in the short-term. The club is on our shoulders and we have to react, and every single player has to think on what we did and more importantly what we have to do, to do better," he said. Sannino only arrived from Italy to replace Zola on Wednesday and Almunia said the Italian was yet to stamp his mark on the players. "As far as I have seen he's a manager with a lot of character who will make us work very hard and be very disciplined. "After a few days he will introduce his way to work and play and I'm sure we will all follow him and support him because we understand it must be difficult for him to come to a new country with a new language."